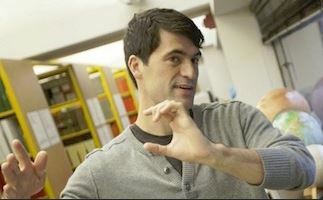 Anyone who follows this site is well aware of David Kipping’s work as Principal Investigator of The Hunt for Exomoons with Kepler, which sifts through the voluminous Kepler data in search of exoplanet satellites. Now based at the Harvard-Smithsonian Center for Astrophysics (CfA), David lists a number of research interests including the study and characterization of transiting exoplanets, the development of novel detection and characterization techniques, exoplanet atmospheres, Bayesian inference, population statistics and starspot modeling. Yesterday he wrote with news that will get the attention of anyone interested in stars near the Sun. A transit search of Proxima Centauri, never before attempted, is about to begin. I wanted to let Centauri Dreams readers know that I’m leading an upcoming observing campaign with MOST this month and the mission’s PI, Jaymie Matthews, recently shared with us an important decision by the Canadian Space Agency (CSA) on May 1st which discontinues funding for the MOST (Microvariability & Oscillations of STars) space telescope as of August 2014 (click here for more). As you probably know, MOST is a suitcase sized space telescope in operation since 2003 (>10 years!). Jaymie Matthews is the Principal Investigator and he is naturally disappointed and seeking alternative ways of funding MOST to keep it going for longer. To be clear, there are no hardware failures onboard which would prevent the mission from continuing for much longer. MOST is sometimes called the “Humble Space Telescope” and there was a running joke that it was the first astronomy telescope which weighed less than its PI! In many ways, MOST is a model for small cubesats and for example the upcoming CHEOPS mission. Unlike Kepler or COROT, this telescope is functioning very well still, so many of us are very disappointed by this decision. The cost of running MOST each year is also relatively low, at just $450K per year. I believe Jaymie is looking for ways to slim that down in efforts to fund MOST privately or via a crowd-funding platform. [We’ll track this effort as it develops – expect more soon – PG]. MOST has discovered a great deal of exciting science both in terms of stellar astrophysics and exoplanet research. Perhaps its most famous discovery was the detection of transits of 55 Cancri e, the first naked eye star with a transiting planet (and I think still the only one!). This kind of high-risk high-gain science is perfect for MOST and nothing else really fills the gap right now. [You can read about MOST and 55 Cancri e in A Super-Earth in Transit (and a SETI Digression)]. Let me also tell you about a very exciting observing campaign for MOST from May 13th-May 28th which fits right into that category. In a 15-day continuous staring run, I am leading a campaign to observe Proxima Centauri in order to search for transits. This is the first transit survey of Proxima to date, as far as we are aware, which is quite extraordinary given it is the closest star. I was inspired by the discovery of the KOI-961 system (Muirhead et al. 2012) to propose for this target. KOI-961 is a late M-dwarf in Kepler’s field with three planets discovered by Muirhead and colleagues. By Kepler’s standards it is a very rare star since M-dwarfs usually appear too faint for Kepler. As you know though, these stars are intrinsically very common in the cosmos with M-dwarfs comprising ~75% of all stars. The three planets in question found were all tiny, sub-Earth sized (0.73, 0.78 and 0.57 Earth radii) and therefore likely very low mass, roughly 1/3 Earth mass or less based on mass-radius scaling relations for terrestrial planets. So the key point is that current radial velocity surveys would never have seen such low-mass planets; they just don’t have the sensitivity. This all makes sense from the emerging trend that smaller stars tend to host smaller planets. If RVs can’t find a KOI-961 system of planets around Proxima (which are broadly similar stars, remember), then could transits possibly succeed? The answer is a resounding yes – because Proxima is so small yet relatively bright at V=11, transits of a system of planets like KOI-961 would cause transits depths of 2.6 to 1.4 mmag, within the grasp of MOST. By the way, an Earth-sized planet would cause a whopping 4 mmag transit! But things get even better: KOI-961 also hosts a very compact set of planets with orbital periods of 0.45, 1.21 & 1.86 days. Being so close to their star, the transit probability of such worlds is enhanced to 11.4, 5.9 and 4.5 percent respectively. That’s not bad at all! Finally, we know that the occurrence rate of planets around M-dwarfs (although not quite as small as this star) is very high, with Dressing & Charbonneau (2013) for example estimating ~1 planet per M-dwarf. On this basis, we argue our chances of success are around 10%. 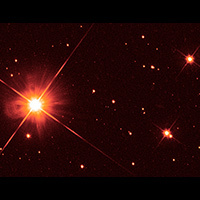 Image: Proxima Centauri (Alpha Centauri C). Credit: NASA, ESA, K. Sahu and J. Anderson (STScI), H. Bond (STScI and Pennsylvania State University), M. Dominik (University of St. Andrews). So yes, our chance of success is just 10%, a modest but respectable figure. Yet this probability should be weighed against the potential reward if we succeed. Just think about the possibilities of not only our nearest star having a planet but the unprecedented opportunities for following-up a bright, tiny M-dwarf hosting a transiting rocky planet(s). Any planet found would become everyone’s favorite overnight and JWST would be able to smell the atmosphere quite easily. But the most compelling reason of all to look for a planet around Proxima is that such a world may provide the impetus needed to build the first interstellar space craft – we could fly there within our lifetimes and send back a photo. If you need any more icing on the cake, a planet receiving the same insolation as the Earth around Proxima would have an orbital period of about 8.7 days and so our 15-day campaign should see a transit like that too. Anyway – I wanted to share with you the news about MOST and the exciting observations coming up, which I think highlight the unique opportunities MOST is able to pursue. I would like to wish David Kipping and his team the best of luck with this project. Finding planets at Proxima Centauri would be a landmark discovery and if any of those planets prove to be near Earth-size and in the Goldilocks zone I believe it would trigger a great deal of interest for follow up projects. I hope 15 days is long enough to detect any potential planets at Proxima. 30 to 40 days of constant observing would have been better if these planets should prove to have longer periods but I suppose there were some constraints on what times were available due to MOST’s orbital mechanics and/or funding. This looks like a very interesting program, and a good use of MOST! I’m a big fan of MOST, but I have also to mention that the transiting nature of 55 Cnc e was also detected by Spitzer (Demory et al. 2011), in parallel to MOST. Good luck with Proxima! Be prepared for a lot of variability, Proxima Cen is unfortunately the most active ultra-cool star that we observed so far with TRAPPIST-UCDTS, thus certainly not a piece of cake for transit search. I think this is a great idea, but Proxima is a tough target. It exhibits short and long term variability (caused by starspots?) that will only complicate a transit search. Beneditct et al ( arXiv:astro-ph/9806276v1) obtained 2 mmmag photometry that showed the various small and long period variablity. Excelent idea, I hope it works. I will be waiting for good results. All this is pretty much moot of course, if the star is pole on. Gaia might be of help there eventually. To Phil, observations don’t indicate that Proxima is pole on to us. However even if Proxima’s equator was edge on to our line of sight any planets there may still not transit depending on orbital properties. Same as an transit search it’s a low percentage effort but still worth trying in my opinion. The astrometry method of planet hunting is great that way because it can detect planet induced shifting in the host stars position irregardless of the planets alignment with its star providing the instrument is sensitive enough. Is Gaia capable of detecting small planets at Proxima? I don’t know. In reading this, I wondered what happens if the orbital plane is perpendicular to our solar system? If our orbital plane is west to east, then the orbital plane perpendicular to ours is north to south. How will a transiting planet be observable in a setup like this? If not slightly off topic say technologically capable aliens are around these red dwarfs their suns gravitational lensing effects would be more powerful than the our Suns. I calculate for Promina Centauri a focal point of ~88 AU or around 13 billion kilometres, much nearer than ours of ~550 AU. They could see and hear us quite well long before we notice them. Having said that RD’s are very noisy and active and Promina seems to be one of the worst. The lensing event later ‘~Oct’ this year may prove more fruitful, perhaps they should use the craft to detect that event as well or save their efforts for it. Michael Gillon, when I try to download your second PDF file I get a “No data received” message. Can you repost it and thank for the information on this parallel search, most important. Regarding those flares detected on Proxima Centauri, how much data do we have on red dwarf flare frequencies and strengths? That could be valuable in itself for a variety of reasons. Good luck for this planet search, and hopefully something positive will happen regarding keeping MOST operational, it certainly has a lot of interesting results to its name. As regards flares, IIRC the nearest relatively-quiescent red dwarf is Lalande 21185, and from what I can tell it has been somewhat neglected by planet searches. Gatewood’s claim of long-period giant planets detected by astrometry has so far not been published in a refereed journal nor has there been any follow-up, e.g. with precision radial velocities. Might be worth taking a look to see what’s there as well. Concerning the flares statistics, I agree it’s interesting, and this will be an important by-product of our survey. SPECULOOS will monitor ~800 M-dwarfs with a radius <0.15 solar radius, a sample large enough to get reliable flares statistics for the bottom of the main-sequence. Speaking of MOST, I have not heard ANYTHING about it’s search for transits for the hotly disputed Bb planet! If they found ANYTHING interesting, it would certainly Not have ben a gas midgit like Kepler 138c, because something like THAT would be so OBVIOUS that it would have been published by now! An atmosphereless ball of rock, however would be much more difficult to discern due to the spacecrafts cracking issue at launch make i vulnreable to light pollution from A. If a rock IS in the data it would hold out hope that Hydrogen does not hang around as long in binary systems as it apparently does in single star systems, to very slowly accumulate on potentially habitable worlds to he point where life becomes impossible! This is extremely important to life taking hold on systems like Gliese 667C! Thank you Michael, both links work. About those flares, I do indeed consider them an important part of the study. Since there has been speculation about worlds circling such stars having native life forms due to their abundance in the Universe, knowing how often they flare and how severely can add to our guesses as to whether red dwarf worlds would be good place for life or not. Plus it will be something new to learn about these stars in its own right. Harry R. Ray, what about Kepler’s “cracking issue at launch”? Could you please go into detail on this and how it is affecting the satellite’s exoplanet searches? Thank you. ljk, the cracking issue was for MOST, NOT Kepler! I am not absolutely certain, but I think it was one of the mirror mounts. This prevented MOST from detecting the PHASES of 51Pegasib with any degree of certainty, which was one of the main goals of the mission. That’s very good news, it’s really a nice oportunity, these percentage of finding are all about statistics and we know planetary systems are unpredictable, so who knows what is the real odds, i think its significant higher, anyways let’s wait and see, i am very optimistic about it. Using the Sun as a focus we will have a capacity to see planets around many stars quite clearly. ~550 AU in the opposite direction to the star. And even then we may not need to go to the exact lensing point. If say we had 8 telescopes with synchronised atomic clocks and a central command processing craft sent on its way to the focal point we could then start the 8 telescopes off perpendicular towards the light rays been bent long before the focal point. All the telescopes need to do is record the photons arriving at a particular time and then reassemble all telescopes data together synchronising the information’s time of arrival at the command craft for transmitting back to earth. We would have a telescope with the resolving power of the Sun (aperture), the same as at the focal point, but with not as much light gathering power. If the telescopes and craft were allowed to continue towards the focal point the light gathering power would increase. So in reality we only need to move part the distance towards the focal point to gain the huge resolving power of the Sun. Getting them to stay in formation could be a huge hurdle though. The angular resolution of using the Sun as the ‘aperture’ is frightfully powerful. And I get a best case spatial ‘length’ resolution of ~21 m at the distance to Proxima Centauri ! Tongue in cheek we might be able to see the very radio telescopes an alien race , if they made Proxima Centauri their home, that were looking for us! Next post: 2030s: The Decade of Europa?